Designed to complement mixed-use office blocks and multiple-occupancy accommodations, the V270d Vertical Letter Box is compact yet capacious with a total capacity of just over 10.3 litres. A popular choice with UK property developers, it meets the requirements of the Homes Guide 2016 Secured by Design initiative and it is EN13724 compliant. 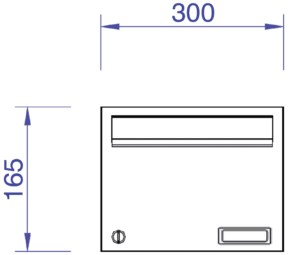 Total dimensions: 270 x 350 x 110mm (width, height, depth). Thanks to its streamlined design, the V270d vertical postbox banks exceptionally well with other units. Post Boxes UK offers a bespoke service for property developers who would like to install a comprehensive mail bank for high-traffic areas, with the only limit being the amount of space you have available. Our integrated service includes schematic drawings, design, and delivery. 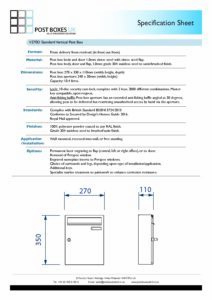 Application and installation options for the V270d apartment block mailbox include wall-mounting, wall-recessed, and freestanding with support legs. With hundreds of RAL colours and premium finishes to choose from, the V270d letterbox can be customised to complement both rural and urban environments and indoor and outdoor locations. Class 0 flame retardant paints are available to meet BS476 Building Control and Fire Regulations, and we can offer mixed colour options for those creating a larger mail bank. The standard lead-time at Post Boxes UK is 4 weeks for custom designed installations. This turnaround time could be longer or shorter depending on the size and specifics of the project. Contact us for up-to-date information. Clean and contemporary in design, the V270d communal mailbox is manufactured in stainless steel and electro-galvanised steel for optimal weather-resistance. Finishing surrounds not only improve the weather-resistance of letter boxes, but they also give mail banks a more integrated look. Post Boxes UK offers a number of stylish finishing surrounds for the V270d letterbox, including cladding, mitre cut flange surrounds, 1.5mm sheet and 15mm volume surrounds. Side support legs, pedestal support legs, and combinations of the two are available for the V270d secure postbox. 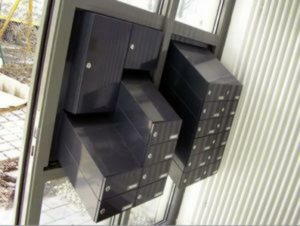 EN13724 regulations state that communal mail banks should not exceed 1800mm height. Contact us for recommendations for your freestanding installation. 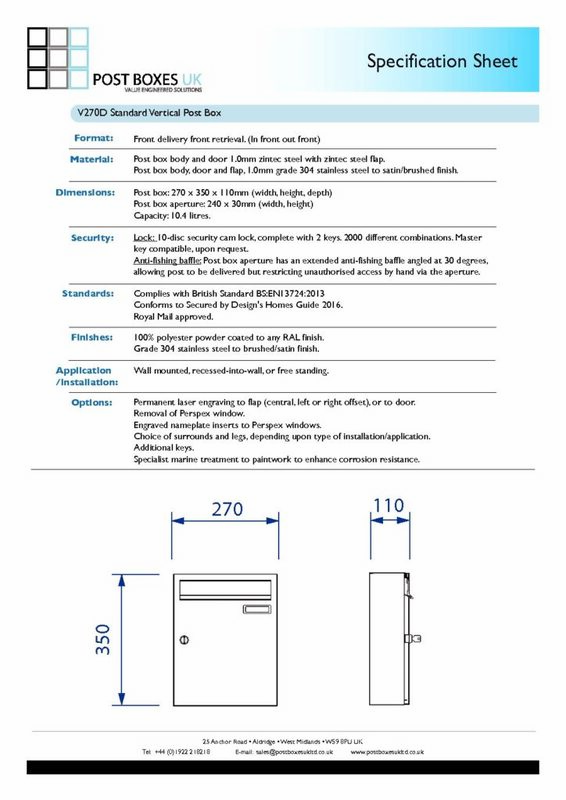 The V270d Secured by Design letter box can be supplied with apartment numbering, identification, and nameplate inserts upon request. Engraved and laser etched options are available, and we stock most popular Microsoft fonts. Post Boxes UK offers comprehensive security solutions for the V270d letter box such as RFID/NFC proximity locks, Salto compatible locks, and padlock compatible looks. A high-quality non-mastered Eurolock Cam Lock comes as standard with every model. If you need spare keys and replacement locks for the V270d post box, please contact Post Boxes UK. We can supply any number of replacement keys for management companies and developers and offer discounts on bulk orders. For peace of mind, the V270d vertical mailbox complies with the Secured by Design initiative as per their Homes Guide 2016. It is equipped with an integrated anti-fishing device, and it also conforms to EN13724. With its aesthetically pleasing profile and long-list of technical specifications, it is no surprise that the V270d mail box remains a popular choice for both commercial and residential environments. It can easily accommodate A4 documents, and multiple units can be banked together with ease.